EEC Environmental’s expertise in the fields of site investigation and remediation, compliance, water/wastewater, and storm water have resulted in cost effective and technically sound project solutions for a wide variety of both private and public clients for more than 20 years. Wastewater treatment and compliance expertise is a cornerstone consulting service for EEC. EEC is recognized as a national leader in stormwater management. EEC has developed a reputation as a leader in the field of soil, soil-vapor, groundwater assessment, remediation, due diligence, and compliance through “Out of the Box” unique technical solutions blended with industry proven strategies. 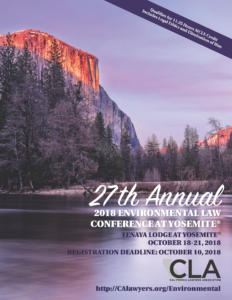 EEC Environmental (EEC) exhibited at the 27th Annual Environmental Law Conference at Yosemite at the Tenaya Lodge at Yosemite, October 18-21, 2018. EEC Environmental (EEC) presented and exhibited at the International Network of Environmental Forensics 2018 Annual Conference in Salt Lake City, Utah, June 25-27, 2018. EEC’s Emily Vavricka spoke on how historical research methods are used in Environmental Forensic investigations in order to reconstruct past site histories and identify potentially responsible parties (PRPs) in environmental litigation cases. 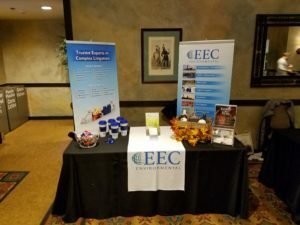 EEC Environmental (EEC) exhibited at the Los Angeles County Bar Association’s (LACBA) 32nd Annual Spring Super Symposium, April 13, 2018, at the L.A. Hotel Downtown in Los Angeles.